BRIDGEVIEW, Ill. (AP) — C.J. Sapong and Aleksandar Katai each scored to help the Chicago Fire beat the Colorado Rapids 4-1 on Saturday, extending Colorado's losing streak to five games. CHICAGO (AP) — The cardinal of the Archdiocese of Chicago is offering prayers for the people of France after fire engulfed parts of Paris' iconic Notre Dame cathedral. BRIDGEVIEW, Ill. (AP) — Nemanja Nikolic scored on a penalty kick in the 84th minute to give the Chicago Fire a 1-1 tie with the Vancouver Whitecaps on Friday night. BRIDGEVIEW, Ill. (AP) — C.J. Sapong scored on a header in the last minute of stoppage time and the 10-man Chicago Fire tied Orlando City 1-1 on Saturday. CARSON, Calif. (AP) — Major League Soccer's past, present and future all converged at Dignity Health Sports Park on Saturday night. CHICAGO (AP) — An investigation into a fire at a Chicago apartment building where 10 children died could not determine whether it was accidental or deliberate. GLASGOW, Scotland (AP) — United States defender Matt Polster has joined Scottish club Rangers from the Chicago Fire. The 25-year-old Polster has signed a 2½-year deal with the Glasgow club, which is managed by former England captain Steven Gerrard. Rangers is second in the league, three points behind Glasgow rival Celtic, which has U.S. forward Timothy Weah on loan from Paris Saint-Germain. CHICAGO (AP) — A firefighter has been injured in a blaze at a high-rise construction site in downtown Chicago. Chicago Fire media affairs says firefighters were called to a fire just before 6 a.m. Saturday at the Vista Tower site on East Wacker Drive. The fire was contained to a basement office. A spokesman for the Chicago Fire Department says one firefighter suffered an injury to the lower body. The firefighter was taken to a hospital in good condition. OAK FOREST, Ill. (AP) — A former suburban Chicago fire chief is accused of using city funds to pay for repairs to his wife's car. David G. Griffin is charged with felony theft, official misconduct and forgery. He was released on his own recognizance on Dec. 29. A criminal complaint alleges that while Griffin was Oak Forest's fire chief in December 2014, he billed the city for $3,623 in repairs to his wife's car and forged a document to indicate that those repairs were made to a city-owned car. CHICAGO (AP) — Authorities say a fire inside a downtown Chicago parking garage killed one worker and badly hurt four others. CHICAGO (AP) — Chicago fire crews have rescued 15 people who were trapped inside an elevator that became stuck in a building. Chief Fire Chief Juan Hernandez says the rescue workers were called to the building late Sunday morning in Chicago's Loop, although it wasn't clear how long the people had been trapped in the inoperable elevator on the building's fourth floor. In a statement, Schweinsteiger insists Chicago can win a championship and says "let's raise a trophy." BRIDGEVIEW, Ill. (AP) — D.C. United ran its unbeaten streak to nine games with a 0-0 tie with the Chicago Fire on Sunday and goalkeeper Bill Hamid finished one of the strongest seasons as the Major League Soccer regular season ended. Hamid had two saves in his fifth shutout of the season and his save percent of 80.9 percent is the fourth best in league history for anyone with at least 40 saves. ATLANTA (AP) — Atlanta United scored two first-half goals and held on for a 2-1 victory over the Chicago Fire on Sunday, setting another Major League Soccer attendance record and securing a spot in the 2019 CONCACAF Champions League. But United's main objective, the Supporters' Shield for the best regular-season record in MLS, will go down to the final week of the regular season. New York Red Bulls remained one point behind the Five Stripes with a 1-0 victory at Philadelphia. ATLANTA (AP) — Michael Parkhurst shook hands with the referee after the final whistle, and then turned his attention to the out-of-town scoreboard. It could have been a really big celebration for Atlanta United. But New York Red Bulls put a damper on things with a win of their own. ATLANTA (AP) — Atlanta United set another Major League Soccer record for season attendance, finishing with an average of 53,002 per game at Mercedes-Benz Stadium. With the upper deck opened and a crowd of 71,812 on hand for the regular-season home finale against the Chicago Fire, United pushed its season total to 901,033 for 17 matches. Atlanta had already surpassed the mark for its inaugural season, when United averaged 48,200 per game. PESHTIGO, Wis. (AP) — The most devastating fire in American history happened on this date in Wisconsin 147 years ago. The City of Peshtigo was wiped off the map by the burning inferno. Peshtigo Fire Museum curator Sally Kahl says 1,200 lost their lives. Few items exist from the 1871 fire, but the museum is filled with stories from those who survived the horrific ordeal. WASHINGTON (AP) — Wayne Rooney scored twice in the second half to raise his season total to nine goals in 16 matches, and D.C. United rallied to beat the Chicago Fire 2-1 on Sunday. A former England captain who made his Major League Soccer debut in July, the 32-year-old striker has five goals in his last three games. BRIDGEVIEW, Ill. (AP) — Djordje Mihailovic opened the scoring and added an assist in the second half to help the Chicago Fire beat Los Angeles FC 3-1 on Saturday. Mihailovic powered home a full volley off Brandon Vincent's cross in the 20th minute to give the Fire (8-16-7) the lead. Nemanja Nikolic doubled the lead in the 29th minute with a penalty kick into the right corner. Brandt Bronico drew the foul in the penalty area against Steven Beitashour. NEW YORK (AP) — Alexander Ring and David Villa scored four minutes apart in the second half and New York City FC beat the Chicago Fire 2-0 on Wednesday night to clinch a playoff spot. NYC (15-8-8), 10 points behind first-place Atlanta, won for the second time in its last 10 games. Chicago (7-16-7) is winless in its last 10 road matches, going 0-7-3. FOXBOROUGH, Mass. (AP) — Cristian Penilla scored in the 70th minute and the New England Revolution kept their playoff hopes alive with a 2-2 tie with the Chicago Fire on Saturday night. The Revs (8-10-11) entered the game five points behind sixth-place Montreal in the Eastern Conference. They haven't lost in four consecutive games (1-0-3) and have five remaining including the season finale at home Oct. 28 against Montreal. LOS ANGELES (AP) — Walker Zimmerman scored two goals and LAFC became the third MLS franchise to reach 50 points in its first season with a 2-0 win over the San Jose Earthquakes on Saturday at Banc of California Stadium. BRIDGEVIEW, Ill. (AP) — Nemanja Nikolic scored twice, reaching eight goals in nine games, and the Chicago Fire beat last-place Orlando City 4-0 on Sunday. Chicago (7-15-6) won for the second time in its last 14 matches. Orlando (7-18-3) has only eight points since May 1. CHICAGO (AP) — Six white caskets were arranged in a semi-circle during the funeral for six of the 10 children who died in Chicago's worst fire in over a decade. The funeral held Saturday at Our Lady of Tepeyac Catholic Church honored five siblings and a cousin killed in the Aug. 28 apartment fire . CHICAGO (AP) — A Chicago Fire Department official says the cause of the apartment fire that claimed the lives of 10 children remains a mystery. CHICAGO (AP) — The deadliest residential fire in years in Chicago claimed its tenth and final victim on Tuesday, as a 14-year-old boy who barely survived the blaze died at a hospital. Although authorities initially believed that two of the people killed by the pre-dawn Sunday fire at a Southwest Side apartment were adults, fire department spokesman Larry Langford said they were all children who ranged in age from three months to their teens. Authorities say a woman returning from work who called 911 about a deadly apartment fire in Chicago saved lives by knocking on doors to alert others to get out. Eight people, including six children, were killed when the fire broke out in the three-story building before dawn Sunday. Two other people were hospitalized in very critical condition. BRIDGEVIEW, Ill. (AP) — Niko Hansen scored his first goal of the season in the 87th minute and the Columbus Crew tied the Chicago Fire 1-1 on Thursday night. Columbus (11-8-7) is 1-4-1 in its last six road matches. Chicago (6-15-6) ended its longest losing streak in franchise history at eight games. Hansen had a deflected cross fall to his feet at the penalty spot and curled in an easy finish. He hadn't scored since his MLS debut on March 25, 2017. MONTREAL (AP) — Daniel Lovitz scored in the 90th minute to give the Montreal Impact a 2-1 victory over the Chicago Fire on Saturday night. Lovita volleyed a bouncing shot into the left side of the net off Saphir Taider's volley. Ignacio Piatti also scored to help Montreal (10-13-3) end a four-game winless streak and extend Chicago's losing streak to eight. BRIDGEVIEW, Ill. (AP) — Bradley Wright-Phillips scored and Luis Robles had his eighth shutout of the season to help the New York Red Bulls beat the Chicago Fire 1-0 on Saturday night. FRISCO, Texas (AP) — Carlos Gruezo scored his second MLS goal to help FC Dallas beat the Chicago Fire 3-1 on Saturday night. FC Dallas (10-3-5) is unbeaten in 11 home matches this season and has won three of its last four overall. Gruezo, a 23-year-old midfielder, side-footed a volley, off a cross from Reggie Cannon, to give FC Dallas a 1-0 lead in the 27th minute. BRIDGEVIEW, Ill. (AP) — David Accam scored in the 95th minute, and Cory Burke had two goals to help the Philadelphia Union beat the Chicago Fire 4-3 on Wednesday night. Accam dribbled through a pair of Chicago defenders and sent home a right-footed shot just inside the left post for his first goal of the season. His game-winner came a minute after the Fire appeared to have salvaged a draw with Bastian Schweinsteiger heading home Diego Campos' corner. HARRISON, N.J. (AP) — The New York Red Bulls have added C.J. Brown to the coaching staff. CHICAGO (AP) — Authorities say a 3-year-old boy who died in a suspicious fire on the city's South Side had been left alone inside a locked apartment as the blaze occurred. Chicago Fire Department spokesman Larry Langford says Maqkwone Jones was in the foster care of an aunt when the fire broke out Sunday at a multi-unit building. 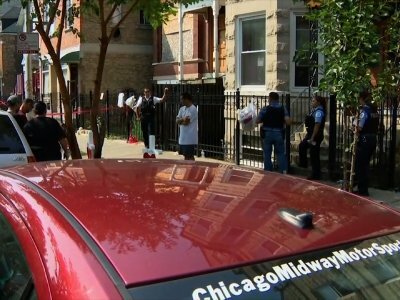 CHICAGO (AP) — Police say the deaths of a young girl and a man who were found following an apartment building fire in Chicago are being investigated as a possible homicide and suicide. The fire was reported Thursday night near Douglas Park on the city's southwest side and police say a 51-year-old man and 5-year-old girl died. A police statement says the deaths are believed to be "domestic-related," but the investigation into the circumstances is ongoing. BRIDGEVIEW, Ill. (AP) — Aleksandar Katai scored twice early in the second half to help the Chicago Fire beat New York City FC 3-2 on Saturday night.